The Book Culture Club (BCC) held its 4th Round of activities at the Library on 4th Nov. 2009 with the theme "City, Culture, Change", book authors Prof. Victor Sit, a geographer and Dr. Chan Kwok Shing, an anthropologist, offered their reading of city change as a cultural phenomenon, with an eye on the Mainland and Fanling, Hong Kong. Prof. Chan Kwok Bun, Chair Professor of Sociology, in conversation with the two speakers, spoke on the question "Why and how do we write books? 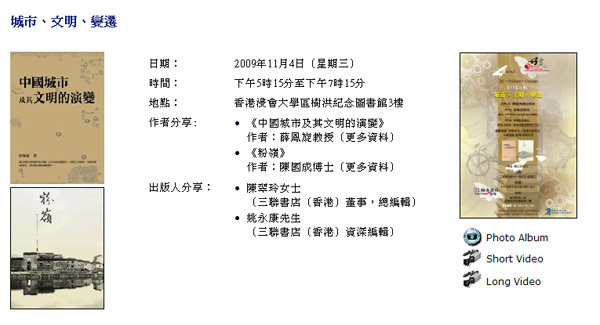 ", and addressed the impact of urbanization in China. Ms. Chen Cui Ling and Mr. Yiu Wing Hong from the Joint Publishing (HK) indicated that with growing interest in Hong Kong local history, the publisher is planning to release a series on the subject, which excited the audience, and met the club's aim to "match-make" between potential authors and publishers. 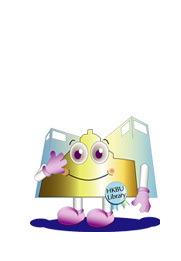 After the exchange, Dr. Terry Webb, the University Librarian, launched the Book Culture Club website. Created to nurture a "book culture" at BU, the BCC website is a great place to learn more about the club's past/upcoming events, BU authors, publishers, and guest speakers. 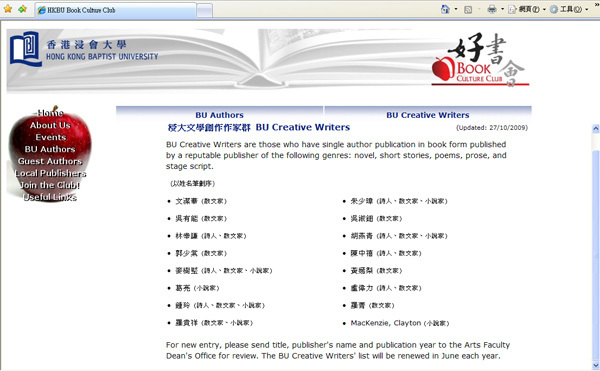 A web page for "BU Authors" and "BU Creative Writers" is designated to showcase the scholarly output of book authors in the University and to display the creative writings by BU creative writers who are among the best in Hong Kong. The event has attracted scholars, publishers, faculties and students. Like in previous events, the attendees enjoyed the music, and got the chance to socialize with the authors and publishers over wine and light refreshments.